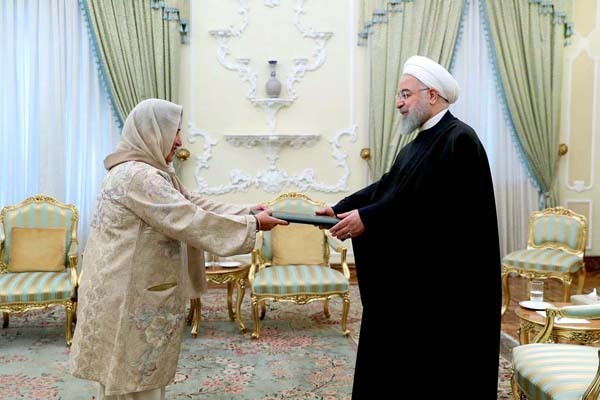 ISLAMABAD, Feb 2 (APP):Ambassador Riffat Masood after formally presenting her credentials to Iranian President Hassan Rouhani on Saturday, became Pakistan’s first woman envoy to the Islamic Republic of Iran. Discussing Pakistan-Iran relations with Ambassador Masood, President Rouhani highlighted the cultural, religious, historical affinities and commonalities between the two brotherly countries. The President said Iran was looking forward to work closely with the new government in Pakistan to further strengthen bilateral relation. He hoped that Ambassador Masood, given her experience in diplomacy and inter-state relations, would contribute positively in furthering bilateral relations between the two countries, a press release received here Saturday said..
As an experienced diplomat and dedicated officer of the foreign service of Pakistan, she has served in several countries, including the United Kingdom, United States, France, Turkey, India and Norway. She also has a native command of Persian (Farsi).